New Release this week 8/8-8/14 plus giveaway for ALL WE HAVE LEFT! 6 New Release this week 8/8-8/14 plus giveaway for ALL WE HAVE LEFT! Happy Monday! 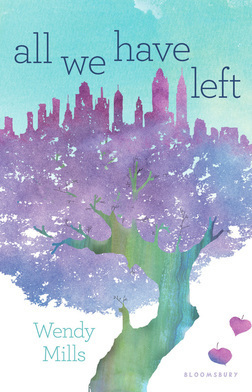 This week seems to be a quiet one, with only one release to spotlight: ALL WE HAVE LEFT by Wendy Mills. But we also have five giveaway winners to announce. Read below to see if you won and read more about ALL WE HAVE LEFT and enter for a signed giveaway! Author Question: What is your favorite thing about All We Have Left? When I first decided to write this story, the tide of Islamophobia that has swept our country was not as virulent as it is now. Even so, my decision to include a Muslim main character in a story about 9/11 felt risky, and I fought every day to get it right. Fear often stems from ignorance, and I wanted to show my Muslim characters as realistically as possible—their strengths, their flaws, their humanness. Every one of us was affected by 9/11; people of all faiths and creeds helped one another with courage and great sacrifice that day. In All We Have Left, I am truly grateful for the opportunity to illuminate and celebrate that diversity. How to Keep Rolling After a Fall by Karole Cozzo: Amanda M.
Recreated by Colleen Houck: Stephanie A. Three Truths and a Lie by Brent Hartinger: Victoria Z. Wake the Hollow by Gaby Triana: Joycedale C.
Wax by Gina Damico: Kelly M.
This one sounds really good. Thanks for telling me about it and for a chance to win. Thanks for the book info for my to-read list! This sounds like a great giveaway. I entered, but it clicked away before I could include my address. I tried to go back, but it wouldn't allow it.